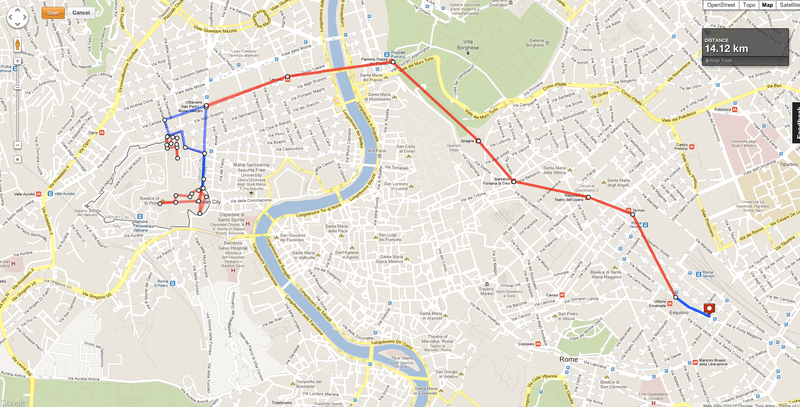 Route: Metro A line to Vatican City, Piazza San Pietro, St. Peter’s Basilica, the Basicila’s Duomo (dome), Museo Vaticano (Vatican Museums), back to Piazza San Pietro.Each day, we are meeting in front of a different Obelisk (a tall square pyramid strucutre like the Washington memorial) in Rome. 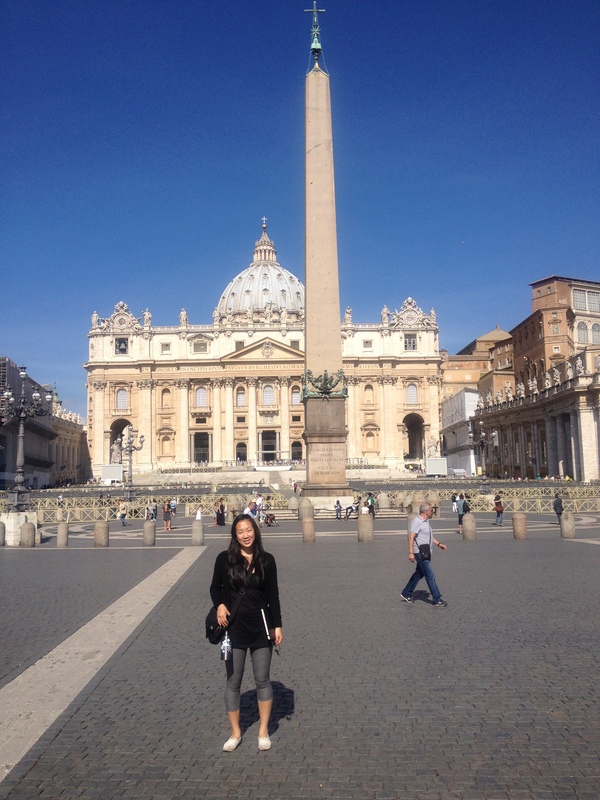 today, we met at the Piazza of Saint Peter to prolouge our journey into the holy land of the vatican. St. Peter’s Basilica was founded on the remains of St. Peter, as most churches in Europe are, based off of reliquaries or pieces of remains of famous saints or Christians. Having anticipated Bernini’s collonades, the scale did not shock me as much as I thought it would. What did was the ornament. Every single inch of the Vatican, save for the city walls, was covered in some form of ornamental tile, print, design, gilding, etc. How small is man in the arms of God? The question refers to scale. In the most important house of God, the answer is, man is tiny like an ant but larger than his own head. Standing/walking in a museum for four hours is more tiring than climbing 323 narrow stairs. The first of many attempts to discern respect and compliance for the beliefs, practices, and places of a religion I do not believe in. I have never been a religious person. I think that once, I sat in the clerestory of a mass in Edmonton when I was three years old. I remember nothing. I was raised on what my parents might call a blend of Confucianism, Buddhist principles, superstitious idioms, and common sense. Last summer I think I came closest to finding some connectedness to something outside of myself, appropriately named yoga, the sanskrit word for union. But if the closest thing I knew to a place of worship was a hardwood floored, white-walled yoga studio with tea lights capable of holding seventeen people, I was in for a tiny shock in Rome. We saw a total of 17 churches in Rome, 2 of which were pagan and not used for worship, 1 of which was a synagogue, and 9 of which we entered. Arguably the most important church of all, St. Peter’s Cathedral is purportedly the house of the Saint’s actual remains, which is what sets Cathedrals apart from regular churches: their relics. When you approach the church form the Piazza, it only seems appropriately sized and relatively “normal” a) due to the amount of people swarming the square taking pictures, crossing over, and waiting to enter the church, and b) because you have not walked up to it yet. This is what happens: Churches are interesting places to talk about experience. Their whole purpose is to facilitate a sacred experience through the reenactment and storytelling of previous ones linked through symbolism. But for someone to whom the symbols have no signifier, or at best, one that holds no personal meaning, this experience is not intended. It is instead replaced with a veil of doubt. The interpretation of art for arts sake. Awe and wonder and hundreds of variations of marble making up tens of larger than life sculptures of dead popes. Columns you cannot wrap your arms around because they are meant to wrap around you. I can see Michelangelo’s Pieta and admire the loving gaze of Mary, but felt more rush, bustle, and elbows than I did trying to see the Mona Lisa in the Louvre. I can gaze up at the marble baldiccino but cannot take it in without feeling pain my neck, unable to focus on any part of the lovely frescoes in the Duomo because they are too far away. I can try to enter a chapel to quietly observe but can be shooed out for silence, for sacredness, for my shoulders. I can walk through a church clockwise and still feel wonder at it’s architecture, it’s affect, and it’s light. Religion has never embittered me like so many I know, yet I will remain a skeptic because I have found a greater purpose, peace with myself, and learned lessons like compassion and forgiveness without the aid of a book and a priest. I know how to show and feel gratitude to people, to situations, to things, and I thank myself because I know myself. I can take responsibility for my actions in words and feelings and learn from them without a confessional. I admit that I respect other beliefs, but it does not mean I will understand. Yet because I do not understand does not give me the right to disrespect. 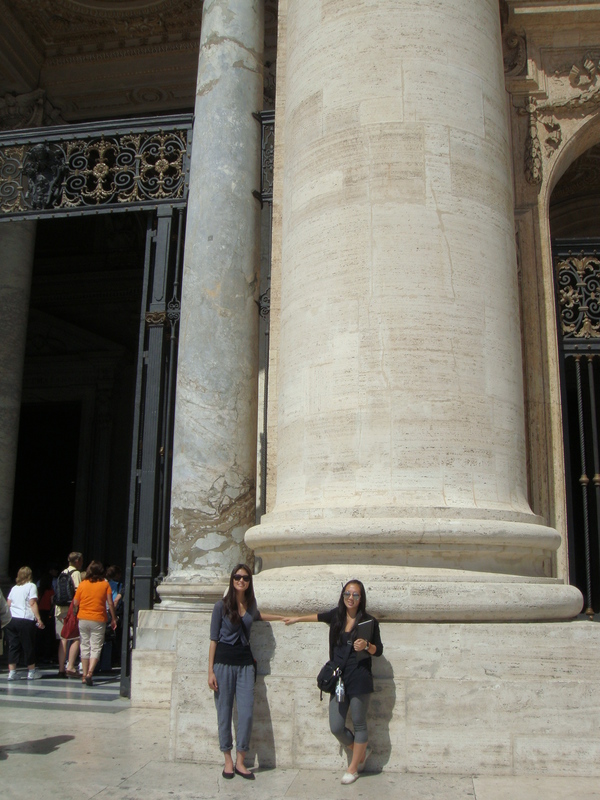 It was strangely peaceful in Vatican City. Sounds pretty Disney, but in whatever form they manifest, I do believe that at the heart of every religion is love, no matter how wide or honest your columns are.